Braaitime is a brand of gourmet cured meats based out of Keansburg, NJ. The company was started in 2005 by Warren Pala. Warren immigrated from South Africa in 2001 and sought to introduce South African-style meat snacks to Americans. 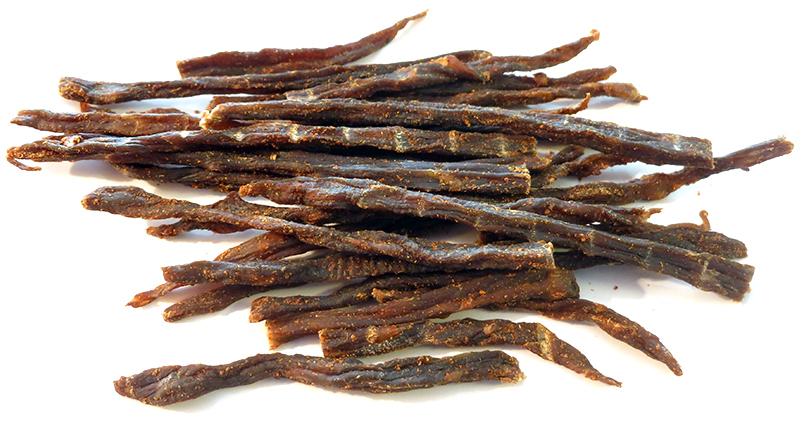 Warren claims to be the only brand of Biltong & Droëwors holding true to the old world methods. 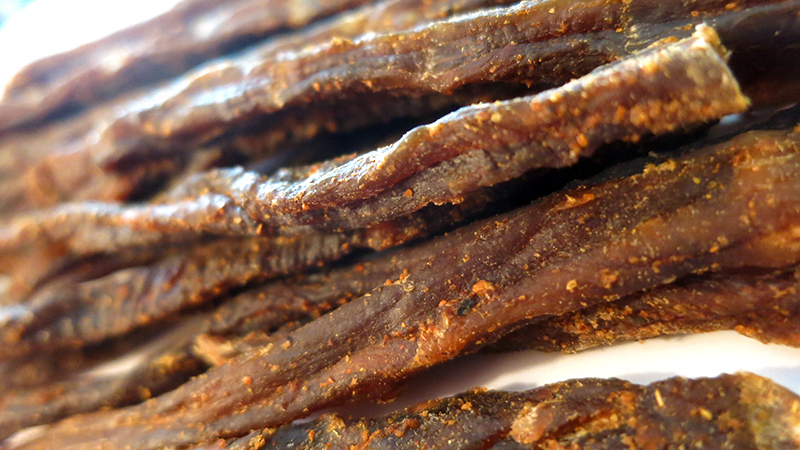 "All other makers of Biltong have followed the 'jerky' method in order to achive USDA approval. They cook the meat to a certain temperature for a certain amount of time". Warren was able to get USDA approval with the help of local Italians who had already convinced USDA inspectors that their prosciutto & capacolo are shelf stable. 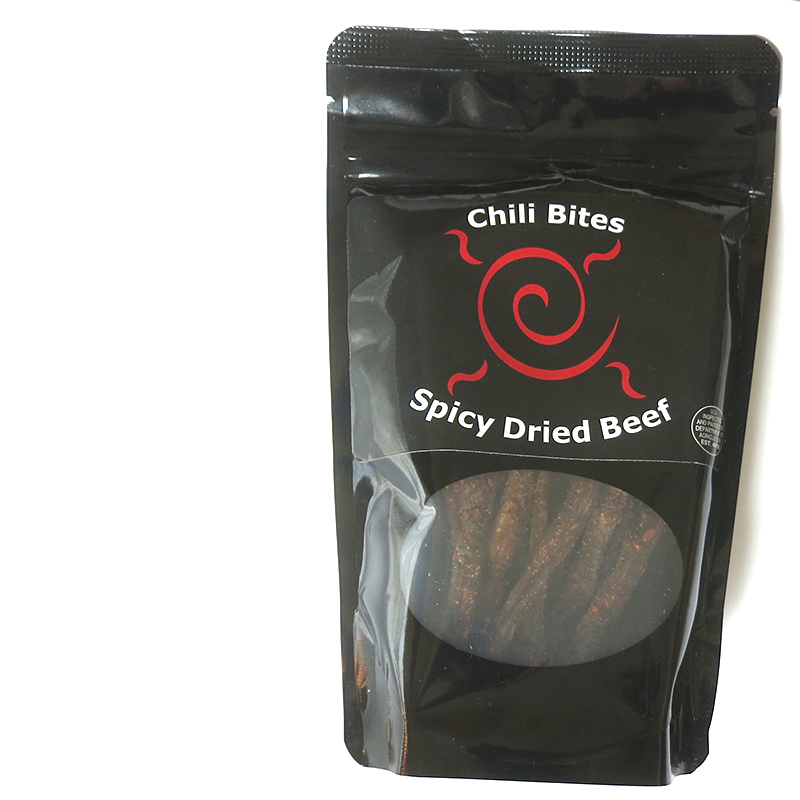 Described by the company as "Spicy Dried Beef", these Chili Bites are more comparable to American style jerky, but cut into narrow strips and dried by hanging in the air. Beef, salt, coriander, black pepper, red pepper, chili powder, garlic, paprika, onion, turmeric. The first thing I taste is a moderate saltiness, followed by a light red pepper/chili powder. The chewing brings on some garlic and onion, along with an aged natural meat flavor. I can also pick up some faint coriander. For being labeled "spicy dried beef" it certainly holds up as being spicy. I get a lot of spicy flavor from the red pepper, chili powder, and paprika, but I also get a lot of flavor from the garlic and onion. It produces a light amount of heat, registering "mild medium" on my personal heat scale (level 2 out of 5). Otherwise, the flavors that define this Spicy Dried Beef is largely the red pepper and chili powder, along with the garlic and onion. The aged natural meat flavor is noticeable, along with the occasional bits of fat. There's a stronger saltiness in this than the company's biltong and droewors. The chewing is somewhat tough, due to the meat's lean, dry character. Otherwise, once it's chewed to down, it feels quite meaty, somewhat like steak. But you'll want to take your time chewing through this because it's chewy enough to wear out your jaws. These Chili Bites from Braaitime is comparable to American-style beef jerky, but ends up tasting a little different. It has an aged meat flavor that comes through pretty well, and is further bolstered by the occasional bits of fat. I found it rather chewy, and in the end this felt like eating tough jerky seasoned with red pepper, garlic, and onion. Overall, it has a good flavor, but doesn't quite give me the "wow factor" I look for in a 5-star rating.